You've found the “U.S. 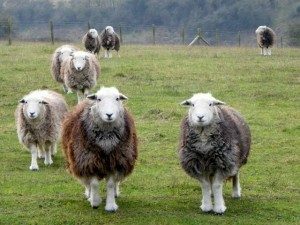 Herdwick Sheep Breeders” page here at Hobby Farm Wisdom! If this is the first time you have visited our site: Welcome! Herdwick sheep are the native breed of the central and western Lake District and have lived on the highest of England’s mountains for generations. They are extremely hardy and can graze over 3000 feet. The word “Herdwyck”, meaning sheep pasture, is recorded in documents going back to the 12th century. They are a dual-purpose breed, producing meat and a coarse, grey wool. Their ability to thrive unassisted is part of the reason many farmers prefer them. A Herdwick's grey fleece is not easily dyed, and is coarse, and so is better suited to use as carpet wool, and also as a natural insulator. Herdwick lambs are born black, and after a year they lighten to a dark brown color. After the first shearing, their fleece lightens further to grey. Rams are horned. These sheep are used for meat and their wool and it’s the hardiest breed in all England.